The Triumf S-400 is a new generation of air defense and theater anti-missile weapon developed by the Almaz Central Design Bureau as an evolution of the S-300PMU [SA-10] family. This new system is intended to detect and destroy airborne targets at a distance of up to 400 km (2- 2.5 times greater than the previous S-300PMU system). The Triumf system includes radars capable of detecting low-signature targets. And the anti-missile capability of the system has been increased to the limits established by the ABM Treaty demarcation agreements -- it can intercept targets with velocities of up to 4.8 km/sec, corresponding to a ballistic missile range of 3,500 km. The system was developed through the cooperation of the Almaz Central Design Bureau, Fakel Machine Building Design Bureau, Novosibirsk Scientific Research Institute of Instruments, St. Petersburg Design Bureau of Special Machine Building and other enterprises. The Fakel Machine Building Design Bureau has developed two new missiles for Triumf. The "big" missile [designation otherwise unknown] has a range of up to 400 km and will be able to engage "over- the-horizon [OTH]" targets using a new seeker head developed by Almaz Central Design Bureau. This seeker can operate in both a semiactive and active mode, with the seeker switched to a search mode on ground command and homing on targets independently. Targets for this missile include airborne early warning and control aircraft as well as jammers. The 9M96 missile is designed to destroy aircraft and air- delivered weapons at ranges in excess of 120 km. The missile is small-- considerably lighter than the ZUR 48N6Ye used in the S-300PMU1 systems and the Favorit. The missile is equipped with an active homing head and has an estimated single shot kill probability of 0.9 for manned aircraft and 0.8 for unmanned maneuvering aircraft. 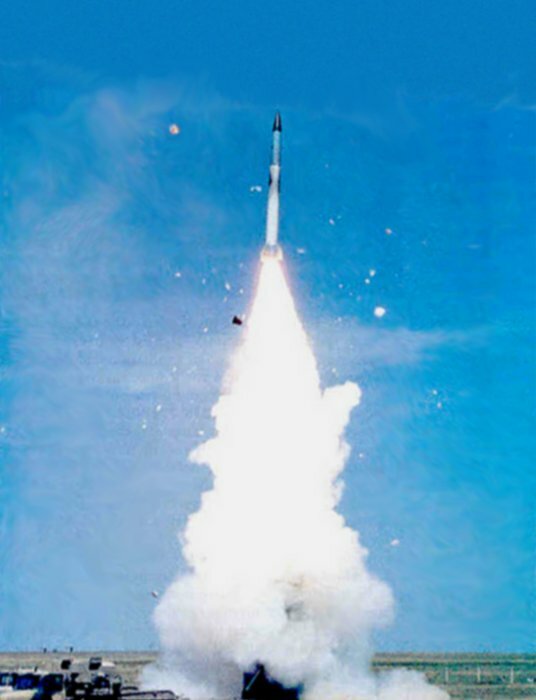 a gas-dynamic control system enables the 9M96 missile to maneuver at altitudes of up to 35 km at forces of over 20g, which permits engagment of non- strategic ballistic missiles. A mockup of the missile was set up at an Athens arms exhibition in October 1998. One 9M96 modification will become the basic long-range weapon of Air Force combat aircraft, and may become the standardized missile for air defense SAM systems, ship-launched air defense missile systems, and fighter aircraft. These new missiles can be accomodated on the existing SAM system launchers of the S-300PMU family. A container with four 9M96's can be installed in place of one container with the 5V55 or 48N6 missiles, and thus the the standard launcher intended for four 48N6Ye missiles can accommodate up to 16 9M96Ye missiles. Triumf provides for the greatest possible continuity with systems of the S-300PMU family (PMU1, PMU2), making it possible to smoothly change over to the production of the new generation system. It will include the previous control complex, though supporting not six but eight SAM systems, as well as multifunctional radar systems illumination and guidance, launchers, and associated autonomous detection and target indication systems. The state tests of the S-400 system reportedly began in 1999, with the initial test on 12 February 1999. As of May 1999 the testing of S-400 air defense system was reportedly nearing completion at Kapustin Yar, with the first systems of this kind to be delivered to the Moscow Air Force and Air Defense District in the fourth quarter of 1999. However, as of August 1999 government testing of the S-400 was slated to begin at the end of 1999, with the first system complex slated for delivery in late 2000. The sources of the apparent one-year delay in the program are unclear, though they may involve some combination of technical and financial problems with this program. Russian air defense troops conducted a test of the new anti-aircraft missile system S-400 on 07 April 2000. At that time, Air Force Commander Anatoly Kornukov said that serial production of the new system would begin in June 2000. Kornukov said air defense troops would get one S-400 launcher system by the end of 2000, but it would be armed with missiles of the available S-300 system. On condition of normal funding, radars with an acquisition range of 500-600 km should become operational by 2002-2003. However, other sources report that while it was ordered by the Defence Ministry, the military has nothing to pay for it with, so it is unclear when the Russian military will get this new weapon. The Russian Air Force is studying a reduction in the number of types of air defense weapons, and it is possible that Triumf will become the only system being developed, providing defense both in the close-range and mid-range as well long-range zones.